Disney’s Frozen Jeep is one of the haircut stations at Sharkey’s Cuts For Kids in Encino. Now open in the Fountain Court at Encino Town Center, right next to the ever-popular More Than Waffles, is a new salon designed with kids in mind. Sharkey’s, headquartered in Connecticut, has been garnering high praise and rave reviews since it’s inception in 2002. After a brief closure of Yosemite Valley and other parts of the park due to a fire in the region, Yosemite National Park is pleased to announce its reopening! The Mariposa Grove of Giant Sequoias, just three miles from Tenaya Lodge, will open to visitors on Monday, August 13. Yosemite Valley will reopen to visitors with limited services on Tuesday, August 14. The iconic landmarks and incredible sights of Yosemite National Park are ready to welcome you back. With fewer crowds and stunning views, now is the perfect time to visit Yosemite! Enjoy this video from our visit a couple of summers ago! See Jennifer Lawrence in her 2016 Best Actress Oscar® Winning role ! This is a great film for girls night in, mother/daughter movie night (just in time for Mother’s Day), or a date night away from the kids! I can’t wait to watch this inspirational film and am honored to share the empowering message of JOY with you! For an added dose of JOY, take a peek at the exclusive clip below featuring director, David O. Russell. JOY is the wild story of a family across four generations centered on the girl who becomes the woman who founds a business dynasty and becomes a matriarch in her own right. Betrayal, treachery, the loss of innocence and the scars of love, pave the road in this intense emotional and human comedy about becoming a true boss of family and enterprise facing a world of unforgiving commerce. Allies become adversaries and adversaries become allies, both inside and outside the family, as Joy’s inner life and fierce imagination carry her through the storm she faces. Oscar® Winner Jennifer Lawrence * stars with fellow Oscar® Winner Robert De Niro, **, Bradley Cooper, Edgar Ramirez, Isabella Rossellini, Diane Ladd, Virginia Madsen, Elisabeth Röhm and Dascha Polanco. Like David O. Russell’s previous films, Joy defies genre to tell a story of family, loyalty, and love. *Jennifer Lawrence, Best Actress, JOY, 2016, 2012; Actress, Silver Linings Playbook. **1980, Actor, Raging Bull; 1974, Supporting Actor, The Godfather Part II. Amazon affiliate link appears in this post for your online shopping convenience. When you purchase merchandise through our affiliate links we jump up and down and pay our operating expenses because we receive an advertising fee at no cost to you. Thank you for your support! Are you picturing us jumping up and down? Everyone’s favorite singing pop stars, the Chipmunks, are back as Twentieth Century Fox Home Entertainment’s ALVIN AND THE CHIPMUNKS: THE ROAD CHIP arrives on Blu-ray™ & DVD March 15, 2016. As expected, this road trip adventure is full of hilarious antics that are “fun for the entire family!” (FOX TV). Hit the road with your favorite fur balls in the funniest Alvin and the Chipmunks ever! Alvin, Simon and Theodore race to Miami on a wild road trip, but their jaunt soon takes a nutty detour, leading to hilarious hijinks and music-packed adventures across the country. The Ultimate Playlist is featured on both Blu-ray™ and DVD so you can MUNK OUT to all the top hits from all the Alvin & The Chipmunks movies! May the best elf win as Twentieth Century Fox Home Entertainment and WWE Studios announces an outrageous holiday adventure when Santa’s Little Helper arrives on DVD and Digital HD tomorrow – Tuesday, November 17th! Priced at $22.98, you can purchase the DVD right now using our Amazon.com Affiliate link from $12.99. Rated PG, this holiday romp runs 91 minutes. After the phenomenal success of The Fault in Our Stars, author John Green returns with another heart-warming tale in PAPER TOWNS, available on Blu-ray™ and DVD. 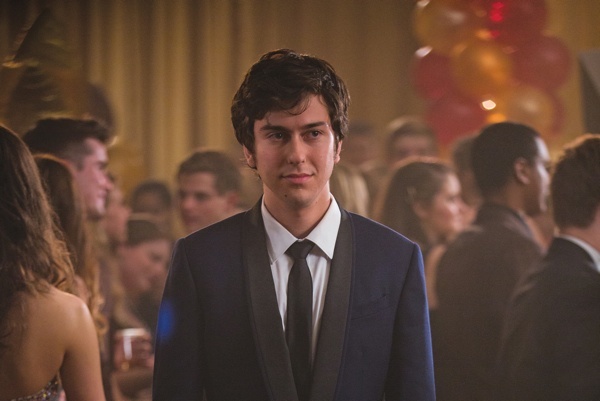 The story focuses on Quentin (Nat Wolff), a high school senior who has been in love with his enigmatic neighbor Margo (Cara Delevingne) since childhood. After taking him on an all-night adventure through their hometown, Margo suddenly disappears–leaving behind cryptic clues for Quentin to decipher. The search leads Quentin and his quick-witted friends on an exhilarating adventure that is equal parts hilarious and moving. Ultimately, to track down Margo, Q must find a deeper understanding of friendship–and true love. 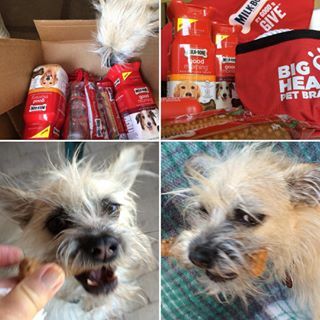 Toby the Traveling Terrier received this cool shipment of treats from the folks at Milk-Bone! Not only did he get Milk–Bone Brushing Chews, which he needed, loved and promptly buried in the yard, but he also got Milk–Bone Good Morning Treats and some pup toys and accessories. Toby loves the treats and looks forward to them after our daily walks. They are actually vitamins, so he only gets one each day. According to “Milk–Bone Human-Canine Health Study” — a survey of 3,000 U.S. dog parents conducted by Milk–Bone brand dog treats (in partnership with Learndipity Data Insights) — humans and dogs positively impact the health of one another, from morning routines to physical fitness. I’ve heard other studies report that people with pets live longer, too. Personal experience with Toby has already got me walking more regularly with fewer missed days than before he joined the family last year. 45% of dog parents report being “active, fit, and healthy” versus 29% of non-dog parents. 44% of dog parents have a “healthy structure and daily routine” – like for morning vitamins – compared to 33% of non-dog parents. 51% of dog parents say they get more exercise because of their dog — but 1 out of 3 pet parents wish their dog would get more physical activity. 55% of dog parents say their lives are “full of happiness and joy” compared to 39% of non-dog lovers. 54% of dog parents report “feeling loved” while only 35% of non-dog parents do. 57% of dog parents who also have children involve the kids in their doggy caring care routines, with most reporting that it teaches them good life habits and responsibility. Pretty cool, huh? If you are concerned about your dog’s health and wellness, you can learn more about the benefits of Milk-Bone Good Morning Treats here. You can also visit Milk-Bone’s Amazon Store using our affiliate link. They have some fun branded doggy swag for sale online, too. Click here, scroll down or click a picture to go to our page on giveaway tools. Now on Blu-ray + Digital HD. Available on Amazon.com (click here to purchase with our affiliate link). Carey Mulligan stars as a headstrong Victorian beauty in this sweeping romantic drama, based on the literary classic by Thomas Hardy. The lovely Carey Mulligan as Bathsheba Everdene in Far From The Madding Crowd. a dashing soldier with charismatic power (Tom Sturridge); and a prosperous, older bachelor (Michael Sheen). This timeless story of Bathsheba’s passions explores the nature of relationships, love and resilience. The charismatic and mysteriously powerful Sergeant Troy meets Bathsheba in the woods. Blu-ray Special Features Spoiler Alert – don’t read the special features – stop reading NOW!